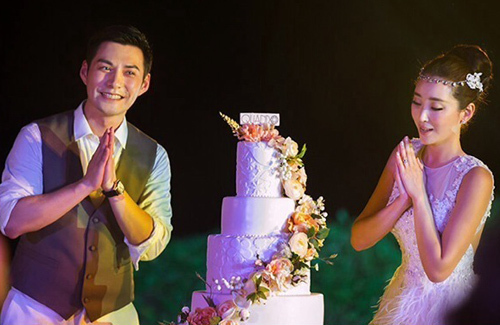 Newlyweds Yan Yikuan (嚴屹寬) and Sunny Du (杜若溪), who held their wedding ceremony in Bali last month, recently posed for Modern Bride <新娘> magazine and shared their newfound discoveries about romance and marriage. Having dated since 2009, Yan Yikuan and Sunny became officially engaged in April 2013, when the actor proposed after watching her perform in the stage play, 21 Carat < 21克拉>. For the lovebirds, 21 Carat seemed like it had been custom-made to reflect their romance, and Sunny admitted that she had decided to act in the play in order to commemorate their love. Later that year, the couple registered their marriage and followed up with a glamorous wedding ceremony in March 2014. For both Yikuan and Sunny, marriage has drastically changed their preconceptions about love. Previously, Yikuan held a more pessimistic attitude toward love, thinking that it would be extremely difficult to find someone who really understood him. Moreover, he tended to shy away from giving his partner all of his heart, which led to much indecisiveness and loneliness. argh, he’s gorgeous. his wife is so lucky. yes, i know she’s beautiful too but a good looking man is harder to come by than a woman. They’re by far the most adorable young celebrity couple from China. I mean… you can actually tell how loving they are. I love them too! And I am so glad that Jayne Starts keeps me up to date on their love story <3 I think they seem extremely compatible in looks and temperament. And personally, I don't think good looking guys are THAT hard to come by – depends on personal standards. I watched two different episodes n I love their acting I have to say they look good together he’s handsome n she’s beautiful. If only they make more movies n work together than that’ll be awesome.